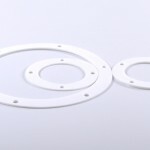 Teschem supplies a wide range of PTFE Gaskets in all sizes, grades, and thickness. Inert – PTFE is inert. As a result, it does not react with other chemicals. PTFE is inert to all oxidation agents and acids. Hydrophobic – PTFE is hydrophobic. It repels all aqueous solvents. As a result, it is impermeable to water and it does not dissolve or corrode. Electrical Insulation – PTFE has excellent electrical insulating capabilities. Thermally stable – PTFE is thermally stable over a wide range of temperatures. Non-flammable – PTFE is non-flammable even when exposed to prolonged heat. Atmospheric resistance – PTFE is resistant to atmospheric factors, oxidation and UV light. These properties allows PTFE to form a reliable seal with a wide variety of surfaces. PTFE gaskets have been adapted through the use of filler materials, or by the expansion of the PTFE itself. This process not only controls its creeping property, but also gives more durability to the gasket by enhancing its physical properties. Since the use of PTFE Gaskets, the problems of seals reacting or corroding is no longer a concern. In addition, the use of PTFE has made a large number of processes which were previously impossible, possible. Teschem offers a full range of modified PTFEs to suit your needs. For more information, please feel free to contact us. * PTFE gaskets are not suitable for high temperature applications. Cork Elastomer Gaskets can be used across a wide variety of applications. Cork is one of the most suitable and economical materials available for gasket manufacturing. Teschem provides a wide range of high quality cork gaskets, covering the needs of all industries. Weight – Cork is light and saves weight. Chemical Resistance – Cork is chemically resistant to most organic and inorganic solvents. Impermeable – Cork is impermeable to all aqueous and non‐aqueous substances. Modification – Cork can easily be modified in dimensions and texture. Elasticity – The elasticity of cork makes it suitable for use in joints that have variable expansion. Heat resistance – Cork prevents excess heat from metal parts damaging more sensitive non‐metal parts. 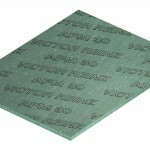 Its light weight allows greater thickness of insulation layers to be placed to control heat transfer. 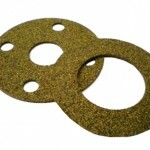 Teschem offers a full range of Cork Elastomer Gaskets to suit your needs. For more information, please feel free to contact us. Teschem supplies a comprehensive range of Graphite Gaskets to suit a variety of applications. Graphite gaskets are well suited to processes that demand a high‐performance, at increased temperatures. Temperature – Graphite can handle both high and low temperatures. This makes it very durable in processes that operate across a wide range of temperatures. Corrosion Resistance – Graphite is corrosion resistant at most temperature and pressures, and is not affected by pH changes. Strength – Graphite has exceptional mechanical strength when used in Gaskets and excellent resiliency. Compressible – Graphite is highly compressible. Low Creep – Graphite has low creep under pressure or temperature. Non-Perishable – Graphite has unlimited storage life. 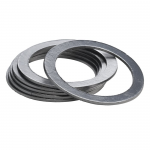 Teschem’s wide range of Graphite Gaskets include Stainless Steel Tang and Foil inserts. These offer increased pressure capabilities and recovery. This allows the gasket to be used in much heavier equipment and harsh conditions. Graphite gaskets can be used in processes that include corrosive substances, such as; ammonia, hot water, high pressure vapours, ultra‐cool liquids and hydrocarbons. This makes them suitable for use in heat exchangers, cooling towers and high pressure pipes. 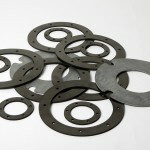 Teschem offers a full range of Graphite Gaskets to suit your needs. For more information, please feel free to contact us. Teschem have a full range of High Temperature Gasket materials, suitable for both small scale and large scale industrial use. 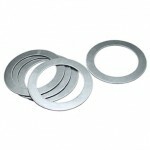 We supply a variety of high temperature gaskets capable of withstanding temperatures above 500°C and up to 1000°C. These materials exhibit low weight loss at high temperatures, and provide high integrity seals at temperatures beyond the range of conventional gasket materials. At Teschem, we stock the highest quality of High Temperature Gasket materials for demanding industrial use. We have the highest quality of popular materials like PTFE, Graphite, Thermiculite, Metal and various elastomeric compounds. Graphite and carbon based materials are also exceptional performers in chemically harsh environments. Carbon based materials with metal fillers are able to resist higher temperatures (450°C) and pressures (2800psi). Teschem is the exclusive supplier for Flexitallic products. Thermiculite is a breakthrough in both heat and chemical resistance. Thermiculite Critical Service materials are rated for temperatures up to 1800ºF and have passed the API 607 fire test. 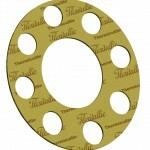 Teschem offers a full range of High Temperature Gaskets to suit your needs. For more information, please feel free to contact us. Teschem stock an extensive range of Rubber Gasket materials. Rubber Gasket materials are ideally suited to applications where pressures and temperatures are in an average range, and where chemical environments are mild. The majority of materials can handle pressures up to 150psi and temperatures from ‐60°C up to 200°C, this is dependent on grade. The three most commonly used types of rubber materials are Ethylene propene (EPDM), Nitrile (NBR) and Neoprene (CR). All three are resistant to common dilute acids and alkalis. Ethylene Propene (EPDM) has excellent mechanical properties. In addition to being non-perishable, it is also resistant to weathering, ozone, oxygen, steam and water. EPDM is suitable for use with phosphate ester-based hydraulic fluids, but it is not suitable for use with petroleum based oils or fluids. Nitrile (NBR) is used in applications that have oil or petroleum residues. However, it can only be used for temperatures up to 80°C. Neoprene (CR) is a suitable material, for rubber gaskets, for use in less demanding situations with air, water, non-oxidising acid and aliphatic hydrocarbons, where extra resistance to heat, ozone or weathering is required. Teschem offers a full range of Rubber Gaskets to suit your needs. For more information, please feel free to contact us. Teschem is a leading manufacturer and distributor of non‐asbestos gaskets and provides materials for all types of industries, having been the first company to introduce non-asbestos gaskets to the Irish market. Whatever your brand preference, Teschem supplies a wide range of specially formulated Non‐Asbestos fibre based materials. All of our non-asbestos materials are designed to meet the highest standards of performance for a range of industrial applications.